This 6-hour excursion immerses you in the rich traditional ancient Hawaiian and Polynesian cultural practices and exposes you to the mana, or divine energy, of the land. On this soul-enriching experience, you will visit Hawai’I’s most spiritual and culturally significant sites (up to 4) like Mapaku’u Point Lookout overlooking the Healing Tide Pools, the Ulupo Heiau State Historic Site, and Byodo-In Temple (in Valley of the Temples Memorial Park). Surrounded by the island’s dramatic beauty, you will learn and experience for yourself why Hawai’I is a special place for deep spiritual connection. There is no other tour like this one. Price includes pick-up-drop-off from your designated location, a welcome lei, bottled water, locally grown organic fruit, and a small gift from the kumu/kahu leading your tour. This tour will take you on a half day (6 hours) excursion to the south/east side of Oahu leaving between 7 and 10 am. The complimentary pick-up and drop off is from your preferred location on the island (there is a $100 surcharge fee for pickup drop off outside of Honolulu metropolitan area). You will not miss any of the popular picturesque beauty of the island while at the same time you will be exposed to the depth of the authentic Hawaiian culture, history and spirituality, the wisdom of the elders, and their connection with the nature of Polynesia. Our small group tours (up to 6 people) will immerse you in surroundings so you can feel a unique connection to a specific place and its particular importance and be embraced, maybe even shifted by the experience. 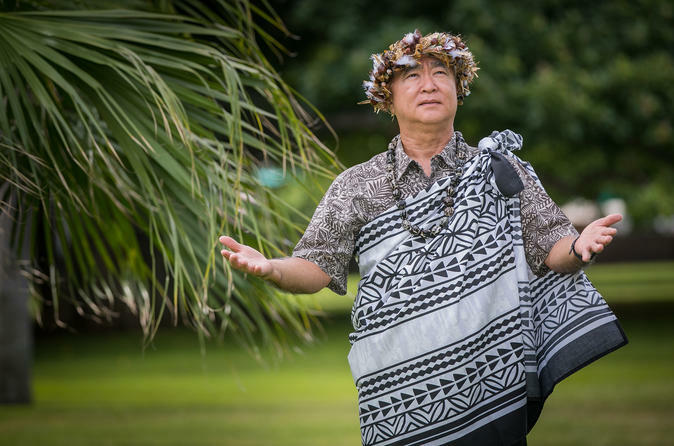 We will introduce you to legends of gods and goddesses from Hawaiian and similar Polynesian cultures; you might witness chanting, movement, prayer, song - any number of ways in which the human spirit shines forth in the world and inspires peace and joy. The Kahu or Kumu will bring Aloha energy into every aspect of your tour. As you journey with us you will come away warmed, relaxed, and ready to absorb even more of the beauty that the islands have to offer. Some of the locations of this tour are Makapu'u lookout (with a view over the healing tide pools), Byodo-In Buddhist Temple in the Valley of the Temples, Ho'omaluhia Botanical Garden and Ulupo Heiau State Historical Site. You will travel in the comfort of a new air conditioned Mercedes mini van. The tour is guided by a native Hawaiian Kahu or Kumu (a hawaiian teacher) and accompanied by a professional driver who will make you feel at home. Our vehicles are a private, air-conditioned, new Mercedes mini vans. There are 6 passenger seats per vehicle available for this tour and if your group is larger than this number, we can accommodate a second vehicle with 7 more seats.